I figure if an appliance has made it to the second-hand vintage store, that means it’s probably not gonna’ break down on you. It’s proved itself too hardy to be broken, even when thrown carelessly in the back hatch along with other garage-sale toss-offs. However, you can pretty much count on your brand spankin’ new appliance breaking on a Friday night about 2 days before the warranty expires. Not happened to you yet? Just keep buyin’. It will. It has me countless times. I’m a magnet. I have a love affair with “my” Osterizer. I’ve given away the two blenders given to us as wedding gifts. When my father-in-law comes, he checks it out for me and orders any necessary gaskets or blades for virtually the cost of shipping and handling. Then, she runs like new. Never a problem with her motor. My sister saw it summarized best somewhere on the internet: “Vitamix? Ninja? No way. Give me an old Osterizer.” IF this puppy’s motor ever goes, I’ll be getting on e-Bay and getting another. It does great for all the challenges I give it. I’ve never had a Vitamix, so I guess it’s not fair to say it’s better. But it’s pretty darn good at only a fraction of the cost. And eats ice like its warm butter. And lastly, my sister also saw somewhere how to best clean a blender–you know, way down in the sharp blade part where you darest not go–and it was such a simple, fantastic tip that I wanted to pass it on! Just fill ‘er up with some water and turn ‘er on! (Translation just in case: Fill it up with some water and turn it on.) So I’ve taken to rinsing out the blender in the sink and then getting the blade clean with her warm water and blend technique. If I do this, it gets the green smoothie grime out pretty well! May you have a glowing week! Let me know–do you have a favorite old appliance that just won’t go away? I may be in the market for it! 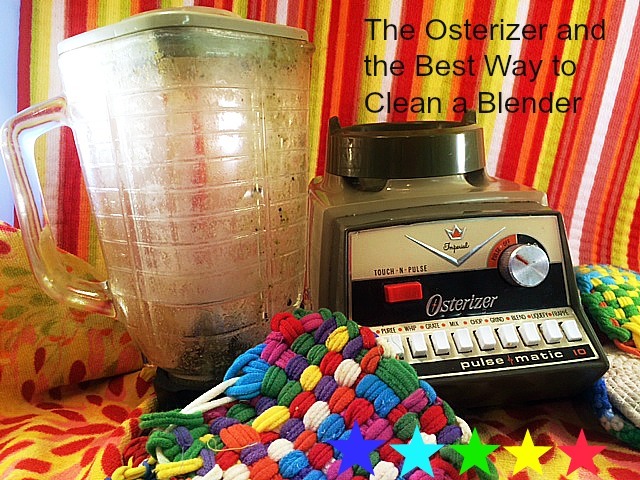 This entry was posted in For the Home and tagged best blender, best small appliances, how to clean out a blender, Osterizer, Review on September 22, 2014 by thehomeschoolingdoctor.